The Pyle Vintage turntable system combines yesterday's classic record playing style with today’s latest technology. Built-in Bluetooth and external full range stereo speakers allow you to wirelessly stream music from devices like iPhones, Androids, Smartphones, iPads, Tablets, etc. The vinyl record system is all housed in an elegantly styled cabinet that can easily become the center-piece and add flare to any room in the house. The unique Vinyl-to-MP3 recording function gives you the ability to save all of your old records into digital MP3 files -- so you can share your music with family and friends! Turn that stack of old records into a space-saving compact digital music library. Listen to all of your records thanks to the (3) speed selectable vinyl playback ability (33, 45 or 75 RPMs). 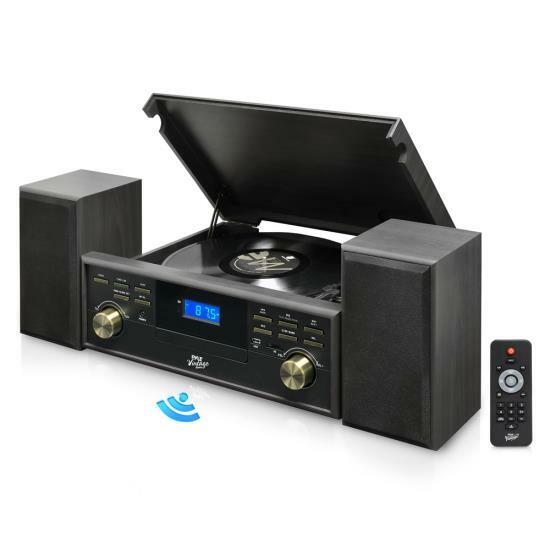 Additional features include the option to connect external devices with the Aux (3.5mm) input jack, single front-loading CD player, AM/FM radio, USB flash drive and SD memory card readers; all designed to fill your room with rich stereo sounds! Enjoy the classic and iconic style along with today's latest hi-tech features with the Pyle Vintage Bluetooth Turntable Speaker System.